Scottish, Irish & Welsh Kilt Pins - Made in the UK! We are happy to offer a wide variety of kilt pins for sale -- from very simple, like our antler kilt pin, to very ornate like our knotwork dress kilt pin. 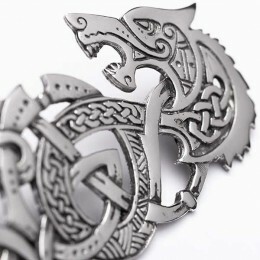 That includes most Scottish Clan Crests, many Irish family names, special selections for firefighters, law enforcement and Masons as well as elegant knotwork designs and traditional Celtic symbols. Most kilt pins on sale are silver or antique pewter in color. 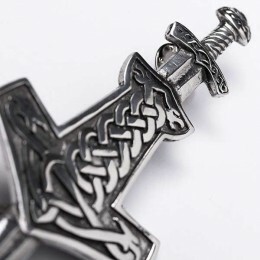 Sometimes Scottish kilt pins are just a jewelry accent, other times a tool for showing your clan loyalty, profession, heritage or group affiliation (such as the Order of Freemasons or the Ancient Order of Hibernians). Many kilt wearers become kilt pin collectors. You may want at least two in your kilt jewelry drawer -- a casual kilt pin (antler?) 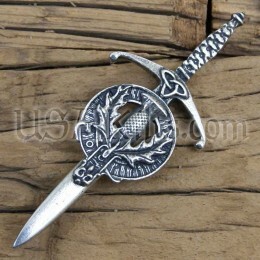 and a more ornate pewter kilt pin for dressing up. Do Irish wear Kilt Pins? The same kind as the Scots? Yes. But there are some unique Irish kilt pin designs including our Shamrock kilt pin, Irish Harp kilt pin and the Irish Family Name kilt pins. Is there a Welsh kilt pin? Yes. Welsh men wear any pin they like. However, we do offer the special two toned kilt pin showing the Welsh Dragon in gold. Do you need a jeweled kilt pin for formal dress? No. A jewel kilt pin or non-jeweled formal kilt pin...it’s all your choice. For Scottish kilt pins silver may be considered more formal, but it’s actually just a luxury option. Any Celtic kilt pin -- a pewter pin perhaps a clan kilt pin -- is perfectly acceptable for formal highland dress. How and why do you Wear a Kilt Pin? Does a kilt pin hold kilt down? The Kilt Pin is worn in the lower right corner of the kilt’s front apron. Typically, the pin is positioned so that its top is about 6” up from the bottom hem of the kilt and about 2” in from the right edge of the front apron (where the fringe is). It is only affixed to the front apron - just the top layer. A modern kilt pin is not there to keep your kilt down. The practical purpose of the pin is to prevent the apron from blowing up in a stiff wind. Large kilt pins used by the British military (the ones that look like safety pins) are worn higher and are affixed to both apron layers. These predate the use of modern hip straps.